Yesterday was the first day at my summer job working for Little River Outfitters in Townsend, Tennessee. I’m going to enjoy working there. A lot of my time was spent doing the more mundane tasks of receiving shipments from some of our distributors and getting them out in the store. The most enjoyable part of working there though is being able to talk about something I love doing. 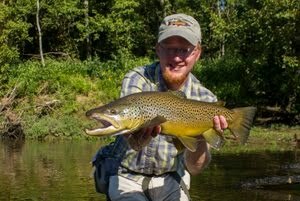 I’ve always enjoyed fly fishing, and helping others with fly selection and offering advice on where to fish is about as good as it gets (and did I mention I get paid for this?). 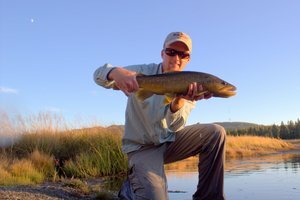 Being able to go fishing in a mountain stream after work for wild trout ain’t bad either… As soon as I got off work I headed up Middle Prong to check out how the fish were doing. The fishing was very good with lots of bugs on the water near sunset. There were little yellow stoneflies both hatching and also out laying eggs. The big news from last evening though is that the large yellow stoneflies are out in force. I’ve never seen that many large bugs flying around at one time. As usual this time of year, just about anything yellow worked well including Neversink Caddis, a parachute Sulphur, and a yellow soft hackle. 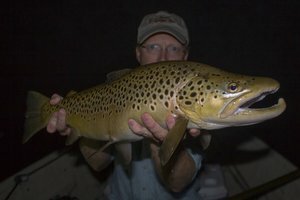 Because of the large stoneflies out and about, I’ll probably be somewhere up the East Prong this evening chasing some larger fish…wish me luck! You got it - I'm wishing you luck, cuz I wanna see some more great photos like that one! Great to meet you yesterday...we paid the price by not making it home until 0330...I'm going to have to figure something out to get some more sleep before/during these short trips to the mountains. BTW, what is considered "fairly high" up on Lynn Camp? We went up higher than we ever had yesterday during the "fish out", but I suspect that we should have gone a lot further - we would have done better. It's tough, with the girls being such flatlanders...they kept asking when we could stop and fish. We made it as far as a little wooden bridge on the trail, a little ways past where Marks Creek enters the stream. We saw some yellow sallies - not a blizzard of them but fairly impressive numbers, on both Cosby and Straight Fork on Saturday and Sunday evening. Ijsouth, it was great meeting you as well. Hope to see you in the shop again this summer if you can make it up... About Lynn Camp, on that first day of the fish out there were some guys that went WAY up there and they were the first 3-4 to get in so even if you had kept going you would eventually have been fishing "used" water. Honestly, I never go very high before fishing. 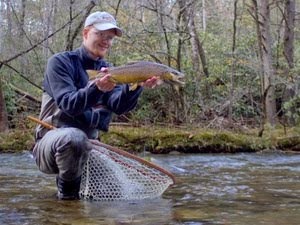 If you want to get beyond the usual day fisherman, you've got to get up well above Panther Creek... For what its worth, I generally plan on 4 miles on any given park stream to leave 99% of all other day fisherman behind. Gotcha...I was prompted to ask by a comment Daniel made in the shop - he asked if we had made it as far as the Panther Creek trail. 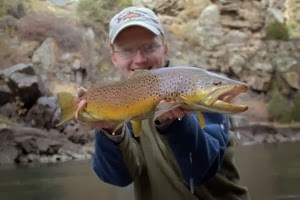 Actually, as I think on things, we really don't have to hike much on most of the streams we fish. You can start catching brookies right out of the parking lot at Cosby, although this last time we did hike a little bit to the higher sections. Straight Fork has road access along a big section of its length, and beyond the road there's no trail. It's hard for us to hike much - there's no way for the girls to prepare for it, given that, as I type this, I sit a massive 15ft above sea level. I can do a lot more of that when I'm up there by myself (I usually get up there alone once a year, at Thanksgiving). The first time I fished the park, I went to Cataloochee, and I must have hiked about 10 miles that one day - I hiked far more than I fished. Hope to get back up soon...hopefully before the 4th of July weekend. I think we'll hit Road Prong this next trip.